There are several companies that have recognized the benefits of hiring independent contractors to work from home. With majority of these companies, you have to apply for the online job and perhaps do an interview. But there are still a few companies where they offer online jobs that hire immediately. Most of the times, all you have to do is sign up, enter the platform and start working. These online jobs are jobs that anyone can do and you can set your own schedule, but I think you will make more money from the jobs that you actually have to apply for. 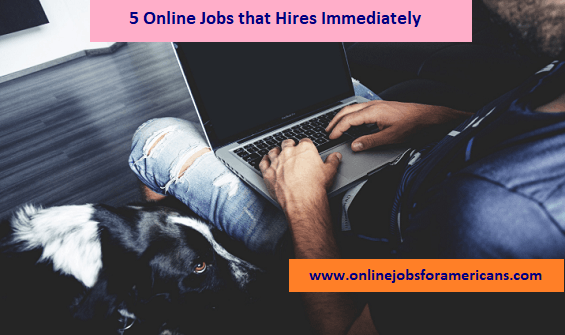 Thus, I would suggest that you still apply for online jobs that are not for immediate hire, but while you wait, you can do these 5 suggested online jobs for immediate start. In this article you will learn a list of 5 online jobs that hires immediately. Get paid to test apps and websites. Provide feedback on website and apps and get paid. You will need to test each website/app, by visiting the site on your computer or mobile device, provide feedback on what works, what you hate about the site, your suggestion for improvement, what you loved about it, etc. When you sign up, you will enter the platform and will have tests available on a first come, first served basis. When you test a website on a computer you get paid $10 per test. And when you test an app on your mobile or tablet you get $15 per test. In order to start testing on mobile, you will need to successfully complete a few tests on desktops first. Although this immediate hire job is open to everyone worldwide, when you qualify for the mobile test. You will be sent a special camera which can only be shipped to a US address. Work from home reviewing calls for companies with humanatic. Listen to a recorded call, and select the appropriate criteria for the call. There is a small commission for each call you categorize correctly. There is no limit to how many call you can listen. The more calls you get right, the more bonus you achieve. You can create your own schedule and work as little or as much as you want. Get paid via paypal weekly. Here’s another online job for immediate start that pays you weekly via paypal to test websites and apps by giving feedback. You will get paid $8 per website test, and the tests usually lasts for less than 20 minutes of your time. Tests are available on a first come first served basis. This online job is open worldwide. Get paid to via Paypal to visit websites and search the Internet and visit websites. Earn cash when you simply browse the web and visit different promoted website, you can get up to $1 to visit websites. This is open in US and Uk.